This week's ride was an uppy-downy cycle down to Malvern and back to keep my mountain training up. 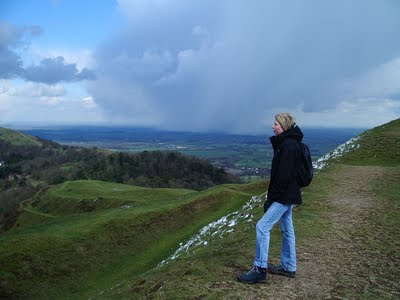 With a pretty strong wind from the West (well, WSW), I decided as per Tuesday's post to head to Malvern. Not only does this route allow me to cycle into the wind on the way out (ie with the wind behind me on the way home), which is always a psychological boost, but it also means I can add in another decent hill - in the shape of the Lickey hills, next to the old Rover plant at Longbridge. Despite being sunny when I get up, it's soon overcast and cool, with a stiff breeze. Lickey Hill seems much less than I expected. It's only 2 miles later, as I arrive in Barnt Green, that I realise I've gone the wrong way and will need to take a detour. Then it's 30 miles of flat stuff to Malvern. Well it looks flat on the map, but with a decent headwind and a few bumps it doesn't feel that easy. 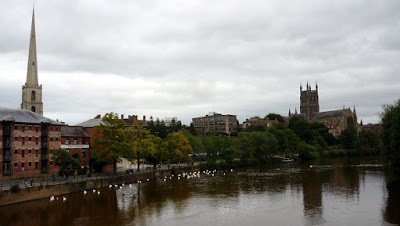 Worcester may be a historic city with a beautiful cathedral, but that doesn't save if from having a standard-issue British High Street and - despite some lovely buildings - it's not a nice place to be on a Saturday lunchtime when I take a break. It's only another 8 miles further to Malvern. The Malvern hills tower over the countryside to the East and inspired, amongst others, the composer Elgar, who lived there and composed the Enigma Variations in the house next to where my aunt and uncle live. 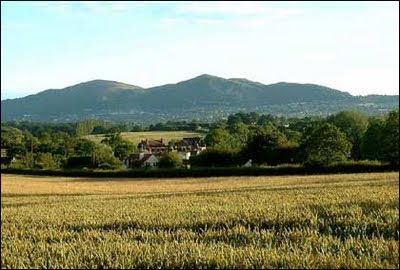 I'd love to move to Malvern, it's a rather sleepy country town with not particularly good transport links to London and a mix of older and hippyish residents. The countryside is stunning - I'd have hills on my doorstep and wouldn't have to ride 10 miles to get anywhere nice! I was going to go further today, but the late start and unexpected detours put the kibosh on that if I want to get home in the light. Once through the town centre, the road runs around the hill, finally crossing it at British Camp, where there are a series of Iron Age earth works, a sort of pre-historic defensive position which probably didn't trouble the Romans for very long. The hill itself becomes pretty steep, so that I've pretty much run out of gears and peaks at 800 feet. It then wraps around the hill, continuing upwards, rather like one of those impossible Escher drawings. Eventually at Wyche, the road drops back steeply to Malvern. This really would be the most amazing place to live for cycling, I'd be as fit as a butcher's dog! Here's a pic of British Camp when Clare and I went walking there last year. After scoffing some pasta for lunch, I head back towards Birmingham, now with the wind at my heels making everything seem so much easier, although it also feels very autumnal and cool. I manage to get the route right this time and it's a far more pleasant experience. I find the right route over the Lickey Hills, which are as high as the Malvern road, and a back route home which is a nice bonus.